These fruity, spicy, tender, gluten-free, beef fajitas are perfect for Cinco de Mayo and the first week of hot summer weather here in the Bay Area! I’m so excited to share them with you! This is a partnered post with my awesome friends at ZSpecialty Foods, a company selling gorgeous savory spreads (certified kosher! ), pasta sauces (certified kosher! ), honeys, nut butters (including my new favorite all-natural sweet chocolate-nut spread for babka!). I met Josh, Nectar Director (best title ever! ), last Hanukkah at a latke cook-off event, and between bites of banh mi latkes we got to talking about the company and all the culinary goodness here in California. He reached out to me when their new website launched and we decided to show off some of their goodies and give Nosherium readers an exclusive discount (expired)! The details are at the bottom of the post, right before the recipe! Josh picked out a several goodies and challenged me to make something for Cinco de Mayo, and I settled on that pillar of Tex-Mex/Mexican-American cuisine – fajitas – fruity, smoky Nosherium Honey Apricot Tex-Mex beef fajitas! Oh, and they are gluten-free! 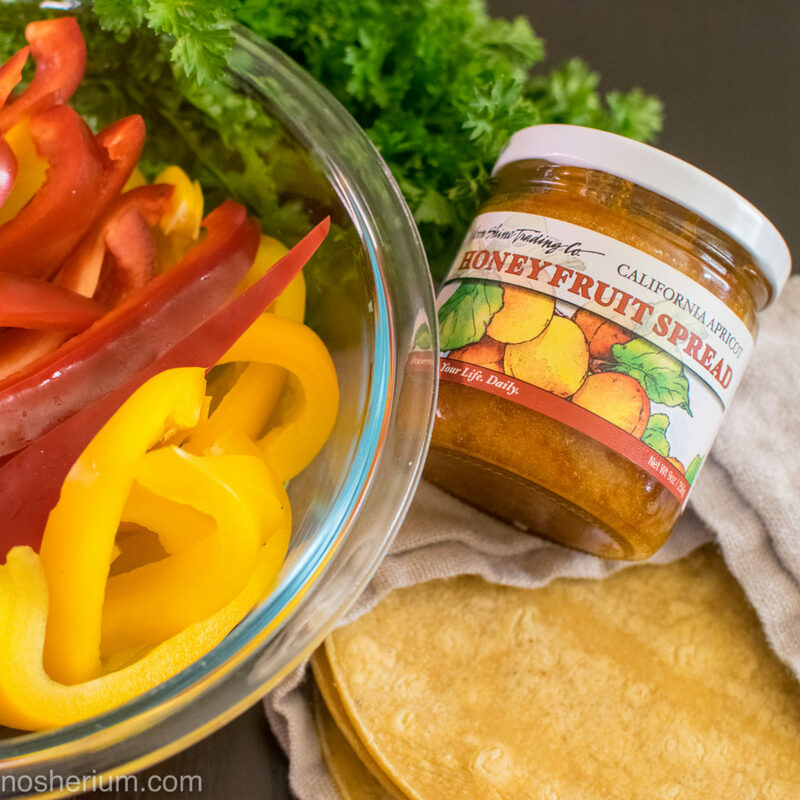 I used the Apricot Honey Fruit Spread from ZSpecialty’s Moon Shine Trading Co. brand. This spread is smoother and less sticky-sweet than jam, has no sugar added, and brings out the complexity of the fruit. I think stone fruits go so well with smoky and spicy notes, so I opened my spice drawer and got cracking! Fajitas and Cinco de Mayo share some entertaining similarities. Fajitas aren’t a wholly Mexican dish – the origin myth varies according to the source, but the story is a deeply Mexican-American one with roots in Mexican ranch hands and cowboys grilling up cheap skirt steak that was part of their pay from Texan cattle ranches. The sizzling platter and hands-on assembly makes it a popular restaurant dish, and it’s reach is wide! Cinco de Mayo in its current form is also deeply Mexican-American. Contrary to popular assumption, it is not Mexican Independence Day (that’s September 16th), and it is hardly celebrated in Mexico. It is the anniversary of the first Mexican victory against Napoleon III’s French invasion of the country – it was a unifying moment against European imperialism, but the war raged on. Since 1862, when Mexican miners in California celebrated the news of the Mexican victory with gunfire and fireworks, the fifth of May has been marked in the United States. Since then, the holiday has been rallying day for the Chicano Movement, labor rights, and diversity as well as a commercialized holiday celebrating beer, tequila and tortilla chips. I haven’t celebrated it often, but used this post as an opportunity to learn a little more about the day and the related foods. In the process I started following several awesome Mexican and Mexican-American food bloggers and I’m so delighted to have a beautiful new-to-me culinary world to explore. This Pacific Northwest-raised Ashkenazi girl is over the moon! Muy Beuno’s fajitas and grilled spring onions look amazing, and I love the look of the blog so much. Pati Jinich’s recipes look divine, The Mija Chronicles has a wide scope – restaurants, travel, recipes, think pieces. I read Food52’s interview with Esteban of Chicano Eats, and now I’m thoroughly obsessed with his recipes, thoughtful approach to culinary cultural representation, and gorgeous food styling. On to the food, right? I’ve made fajitas several times before, most successfully when following J. Kenji López-Alt’s recipe on Serious Eats. He uses a simple proportion of ingredients for the marinade, so I used that as a starting point. The cooking instructions are for grilling, so I hacked my favorite flank steak technique to get to a workable one-pan stovetop method. I modified several things in terms of flavor-profile – I got rid of cilantro (don’t hate me, it’s in my genes!) and green peppers. Kenji’s marinade uses soy sauce, which I suppose isn’t “authentic” but this is already a fusion dish and I love the umami. I used tamari because it is delicious and gluten-free. 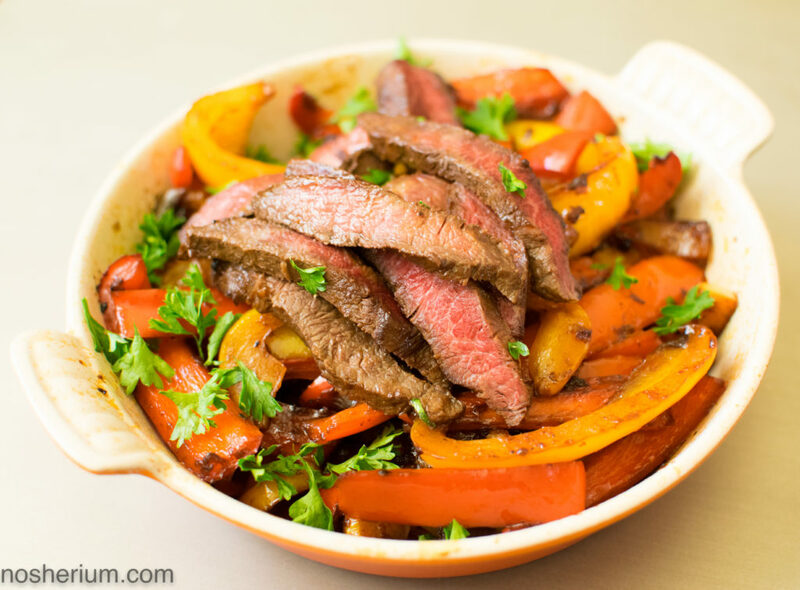 The approach is simple – marinate the meat, then sear it in a cast iron skillet, while the meat is resting, sauté bell peppers and onions with some reserved marinade. All that’s left is to slice the meat and toss it in the skillet. BAM! Dinner. For accompaniments, I made a super quick version of guacamole (mash avocado with minced shallot, jalapeno pepper, and lime juice) and a very improvised Pico de Gallo (chopped tomato with onion with white wine vinegar and meyer lemon olive oil – not at all authentic, but it was tasty). Toast up some yellow corn tortillas, and you’re set! The result is simple, delicious, heartily flavorful dinner, most of which can be prepared well ahead of time! 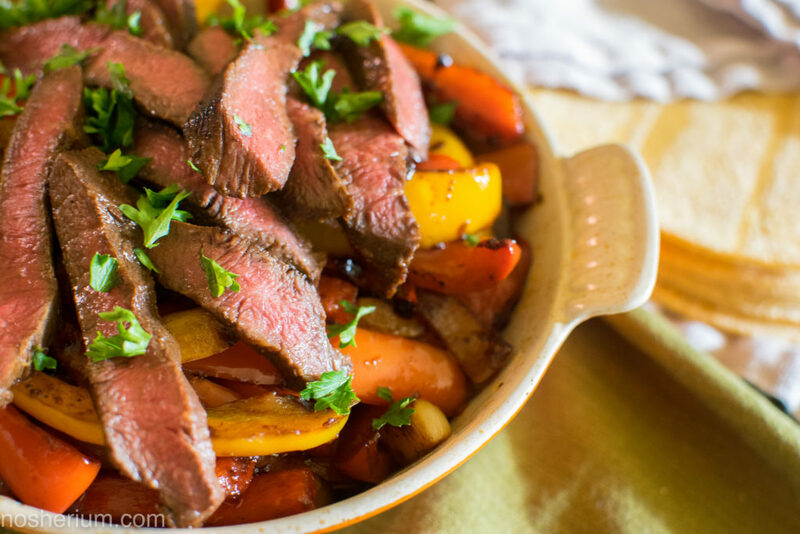 The meat is tender, a bit charred and smoky with the perfect touch of apricot sweetness, and the peppers have a gorgeous slouchy, silky texture. If you’re looking for a soy-free, more paleo-ish option, coconut aminos can work, and lettuce cups can stand in for tortillas! It’s gorgeous, fun to eat, and the perfect way to celebrate everything that unites us! Check out ZSpecialty Foods before May 31st and use discount code NOSHERIUM for 20% off your order of honeys, jams, chocolate-nut spreads (way, way, way better than the standard options! ), and anything else! Free shipping for purchases starting at $75. I’ve picked up some jars as host(ess) gifts and housewarming presents, and I intend on ordering some beeswax candles and bee pollen (KOSHER!) too! 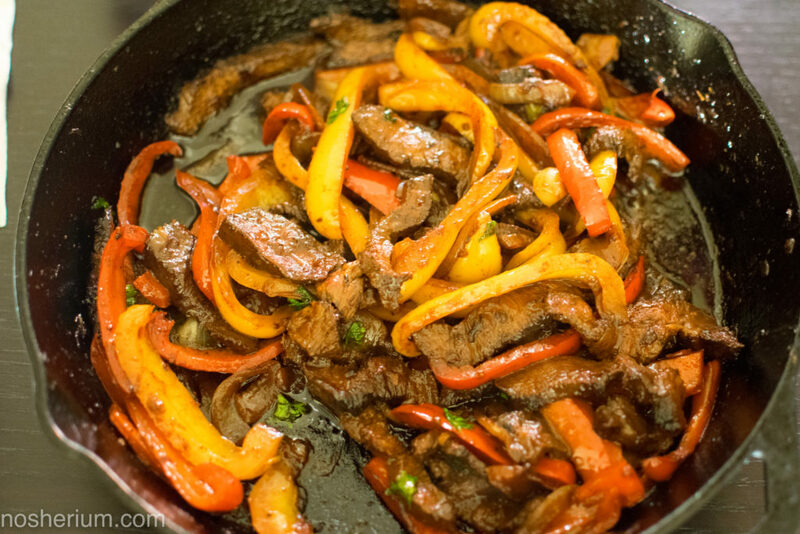 Tender, fruity, smoky, spicy, gluten-free beef fajitas for Cinco de Mayo, or any time! Combine all marinade ingredients in a medium sized bowl. Reserve 1/2 cup, transfer the rest to a large ziplock bag with the steak. Marinate steak, sealed in the bag, in the fridge for at least 3 hours, up to 10. When you are ready to cook, remove steak from the bag, discard the marinade, and pat the steak dry. Heat a cast iron skillet over medium-high to high heat. Add enough canola or grapeseed oil to cover the bottom of the skillet, and heat until shimmering. Cook steak, turning every 30 seconds until cooked slightly less than your liking, and nicely brown or ever charred on the outside. Do not overcrowd the skillet, do this in batches if need be. Let steak rest on a plate or platter. Add vegetables to the skillet, and saute until nicely browned and very tender. Transfer the steak to a cutting board, adding any accumulated juices to the skillet. Thinly slice the steak across the grain, add to skillet, and toss to combine. Serve with tortillas or lettuce leaves and your choice of toppings! Previous Article← Round Up: May 1st – May Day!